We are pleased to announce that two new online tools related to the Human Behaviour-Change Project have been launched. The effectiveness of behaviour change interventions depends on good understanding of the links between behaviour change techniques (BCTs) and their Mechanisms of Action (MoAs) i.e. the processes through which they affect behaviour. Considerable progress has been made in developing a method for specifying BCTs. The Theories and Techniques project aimed to develop and test a methodology for linking BCTs to their hypothesised MoAs (see project protocol: rdcu.be/ORFH). This online Theory & Techniques Tool provides a simple way of accessing the data from the project https://theoryandtechniquetool.humanbehaviourchange.org/. 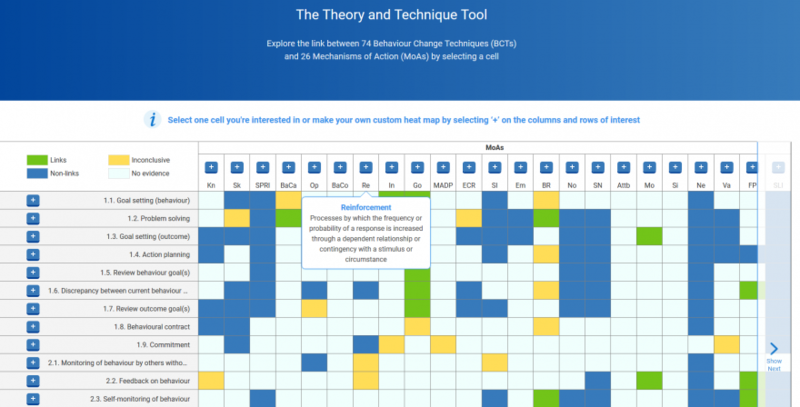 The tool is a heat map of 74 BCTs and 26 Mechanisms of Action (MoAs) resulting in 1924 cells. Each cell represents the link between a BCT and an MoA, with stronger links represented in green. The strength of a link is determined by the triangulation of data from two studies, a literature synthesis study and an expert consensus study. Within each BCT-MoA cell, you will find the results of the literature, expert consensus and triangulation studies. By clicking on a cell, you will find the data from all contributing studies. The website provides an introduction to the tool and guidance on how to use it. Carey, R. N., Connell, L., Johnston, M., Rothman, A., de Bruin, M., Kelly, M. P., & Michie, S. (2018). Behaviour change techniques and their mechanisms of action: a synthesis of links described in published intervention literature. https://doi.org/10.1093/abm/kay078. Connell Bohlen, L.E., Carey, R.N., Johnston, M., Rothman, A.J., de Bruin, M., Kelly, M.P. & Michie, S. (2018, October 16). Links between behaviour change techniques and mechanisms of action: an expert consensus study. https://psyarxiv.com/fge86/. Johnston M, Carey RN, Connell LE, Johnston D, Rothman AJ, de Bruin M, Kelly MP, Groarke H & Michie A. (2018, October 16) Linking behaviour change techniques and mechanisms of action: Triangulation of findings from literature synthesis and expert consensus. https://psyarxiv.com/ur6kz/. Our open access online repository of published papers reporting interventions coded by BCTTv1 has over 400 papers. This is a great resource for the research community. We have now added instructions for users to upload new research papers with interventions coded using BCTTv1. Full guidance on how to do this is provided on the website: http://www.bct-taxonomy.com/interventions. The usefulness of this resource will depend on the research community updating the repository with information from their own, or others’, papers.